This kit is for people that have those bad breakouts that also have the pustules. It is a constant battle to keep it in check. These 5 pieces are designed to help. 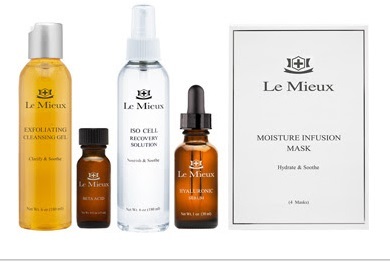 LeMieux Dry Rosacea 4 piece kit. This kit is for people with sensitive skin, redness on the checks, or slight rosacea characteristics. Please go to our website. http://www.karinherzog-jmilan.com You may use the code young for your savings. I just added a new Category on my website http://www.karinherzog-jmilan.com called New Osmosis Facial. On my front page under categories, the very first one is New Osmosis facial. It gives you ideas you may implement at home to take care of your skin. Many of my clients already have these products and I am showing you how to use them in the convenience of your own home. Many of us do not have the time or money to always run to the spa, so I love to show you how to take care of your skin with an easy routine. This facial is set up at an anti-aging treatment. You may make small changes and make it helpful for acne, anti-aging, rosacea, pigmentation and whatever your particular skin issue is. Osmosis now offers smaller sizes in many of their products, so you may purchase the smaller products, until you find what works for you. Please email or call me if you have any questions. jmilanent@gmail.com. I am happy to set up a facial especially for your skin. For Anti-aging and Acne, you want to use Saian Skin Care. You may feel confident all ingredients are natural. There are no fillers or parabens. Their Enzyme Mask is great for all skin types. It is firming, calming, helps with pigmentation, and rosacea. Everyone should have this mask. Saian has the best Hyaluronic Acid and Tri-Active serum to help restore the collagen, firm the skin, and for healthy plump hydrated skin. There number one selling product is Saphir Active Renewal Serum. They have the best 3 cleansers for anti-aging, acne, and normal skin. Perle, Emeraude and Strawberry Cleanser. The sizes of the products are generous and will last. You only need a small amount. Please go to my website for more information. Catalyst by Osmosis Skin Care, is the latest product by Osmosis Skin Care. It is peptide based and gives so many beautiful results to the skin. Originally formulated to help with Pigmentation and Melasma, it has been found to help rosacea, capillaries, pre-cancer spots. Just apply twice per day and then add your favorite serum afterwards. This is not sold as a miracle product, just a product that really works. I am on my 4th week now and can see such a nice difference in my skin. It only takes a few drops. I apply it to the areas on my face I am not happy with and then give a quick over to my whole face. Use it under the eyes, and on the nose area. Your pores will look smaller. It is fun to have beautiful as I get older. My skin is better now than when I was younger. Saian Skin Care has a wonderful product Amethyste Replenising Cream which may be used by people with sensitive or acneic skin. Its main ingredient is Hyaluronic Acid. It also contains squalane, and Apricot Kernel Oil. It is very light to the skin and also very hydrating. Amethyste Cream may be used by people with rosacea, acne, dry, sensitive or even normal skin. It relieves dryness, itching, and burning of the skin. Karin Herzog, Osmosis Skin Care, Pure Skin Junkie, and PCA Skin all have excellent products for the treatment of rosacea. When you have roseaca, it is imperative that you kill the bacteria and hydrate the skin. One without the other will not work. If you just kill the bacteria, you will be dry. If you just hydrate, you will still have breakouts, because you have not killed the bacteria. In Osmosis, Mend is their starter product to get your skin adjusted to the Osmosis line for rosacea. When your skin is acclimated to the Mend, you may move up to the Calm. I have clients that have suffered from Rosacea or years, that now have clear skin. Karin Herzog products also hydrate and kill the bacteria. Her products contain oxygen that is so healing. Oxygen Face Cream, Vita A Kombi 1 are excellent for rosacea. Very healing and calming to the skin. Pure Skin Junkie has Chill Out. Chill Out is great for rosacea. That along with the Cellular Serum. Use a gentle cleanser and Chill Out. PCA Skin has Nutrient Toner, which has hundreds of vitamins mostly derrived from the Pumpkin. Clearskin and Rebalance will help heal and hydrate the skin. To purchase these products please go to my website.